After Gofuku no Hi, I realised owning at least one other hakama would greatly expand my kimono wardrobe. Even though I’m still far too chunky to fit into most of my kimono properly, they do a great job of hiding a less-than-ideal hip wrap. 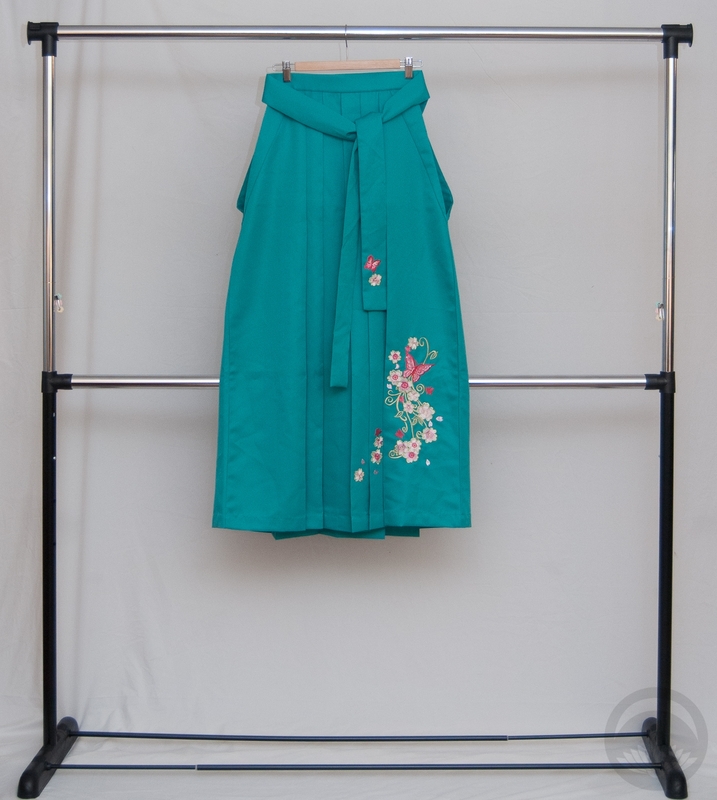 I found a lovely modern teal polyester hakama from ebay seller Yoshihori and snatched it up. The seller had embroidered ones too, which were utterly lovely, but significantly more expensive. So I decided to be reasonable and buy the plain one. So imagine my surprise when the seller contacted me, incredibly apologetic, telling me the plain one was sold out and would I like the embroidered one instead, for no extra charge? Of course I said yes! 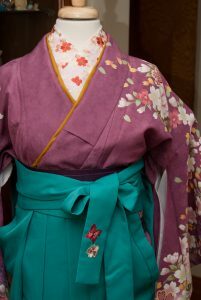 A few days after I bought it, but before it had arrived in the mail, a friend of a friend posted on facebook that she was selling off a large chunk of her collection, including a gorgeous mauve kofurisode that was clearly meant to be worn with hakama. The colours were gorgeous, and it had a wonderful sort of large-scale Taisho-inspired feel to it. I knew it had to come live with me, and be paired up with the new hakama as soon as it arrived in the mail. Initially, I’d planned to wear the ensemble to Otakuthon, Montreal’s big anime convention. However, it’s in the middle of August and we’re already regularly breaking the high 30s temperature-wise. Even in a heavily air-conditioned convention centre, there’s no way I could wear synthetic awase and not die. So I decided to put the outfit together to see how it looks. 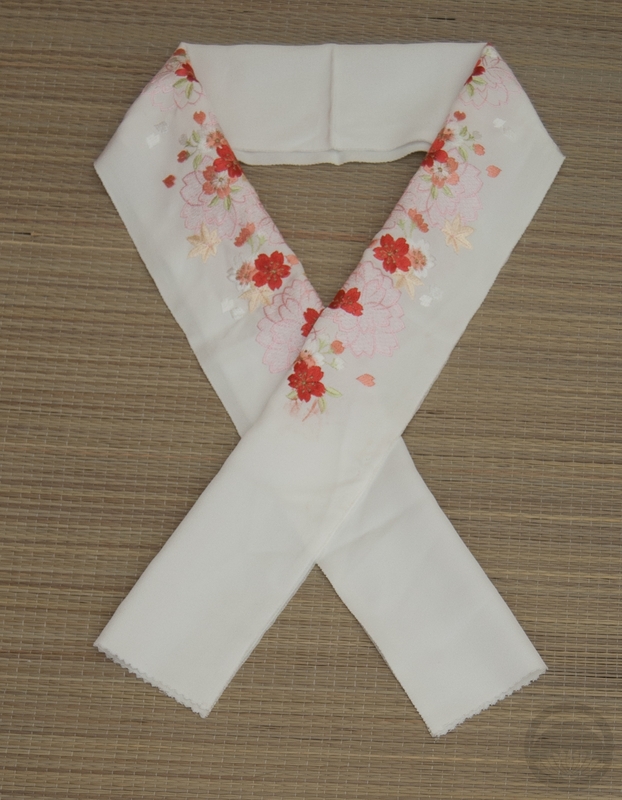 Everything is very heavily decorated with sakura, so of course I chose a coordinating haneri. I waffled a bit between yellow and purple obi, but decided to use the purple so it sort of disappeared. The kimono and hakama are busy enough, the outfit didn’t need another level of contrast. I know I say this a lot, but I love love love how this turned out. I can’t wait until it’s cool enough to wear it. Maybe for my birthday, in November? They followed me home, I swear. 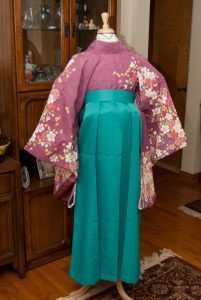 If you’re an avid collector, it can get to the point where kimono and related items really do just start following you home. As I mentioned in this entry, I came home with a bunch of kimono in my suitcase, despite my best efforts. One of them is a gorgeous Tokaido piece I’d actually purchased on eBay and had shipped to my friend Jamie, due to the postal strike, and it will be getting its own entry. Here are the other two. We were out browsing and shopping in Soho and Jamie started getting amusingly evasive and vague about our next destination. I was so touched when we ended up at Kiteya, a beautiful gem of a shop. The front of the store is filled with wonderful Japanese handicrafts, jewelry, art objects, etc. The back room has two big comfy chairs (which made the rest of our group very happy) and a bunch of kimono (which made me very happy). The service was wonderful, everyone was very friendly and helpful. There were some incredibly gorgeous vintage pieces, but their prices were pretty much gallery-standard, and while they were not unreasonable they’re more than an online bargain-hunter like myself is used to paying, and the only piece I was tempted to justify a big price on (Taisho houmongi with gorgeous peacock design) was just waaaaay too short for me. I was about to give up when I noticed this modern synthetic piece buried under a bunch of other things. This colour is not only impossible to describe, it was impossible to photograph too. It’s sort of a dusty mauvey brown taupe something I dunno. A pinkish brown, a brownish pink, I’m not sure? But I do know it’s completely adorable. I love pussywillows, they remind me of my grandmother, who always had a bundle in her living room. The ones on here are very adorable too, in soft springy shades of pink and blue. It’s a nice versatile spring kimono, and I look forward to wearing it. I needed more wearable, unlined pieces anyway. This is kind of a funky oddity – it’s a half lined komon but arranged in very specific stripes, there’s even a seam across the hips to help ensure the pattern falls properly. I actually won this awesome piece in a raffle at the street fair mentioned a few entries back, and it’s not only unique and quirky, but it fits me really well. It’s so awesome. It’s half-lined in bright red, but the top is unlined which will help keep it airy and breathable. I also love how the design from afar just looks like little diamonds, but up close they’re actually fans. It’s so charming. So as I mentioned in my last post, I was going to be visiting Naomi. One of the things we’d planned to do was a full geisha henshin, something I lacked both the know-how and wardrobe to do. I knew she had a lovely purple hikizuri with ferns on it and we’d decided to use that. HOWEVER… about a month ago, a gorgeous hikizuri in shades of purple with indigo ariso (curled up jumping carp) showed up on eBay. I wanted it desperately, but with my trip coming up I couldn’t justify bidding too much, so it slipped out of my grasp. Imagine my shock when Naomi was handing me things to look at and said “oh, and I have this old thing, you can keep it”, and I saw that very hiki when I unfolded it. I was in a bit of a tired, emotional state to begin with and I totally lost it and started crying, I was so touched. It turns out she and Erica had conspired to get it for me as a “very very early birthday/Christmas present”. For the record, my birthday is in November. So anyway, when we did the henshin today, of course I had to wear my new hiki. I have to say, it still feels weird to say that. My new hiki. Mine!. But I digress. It was a super fun experience, and we took waaaaay too many pictures. I’ve uploaded my favourites to Flickr, and plugged in a gallery below, but here are some of the best. And, just because it’s hilarious – geisha henshin with a mohawk. 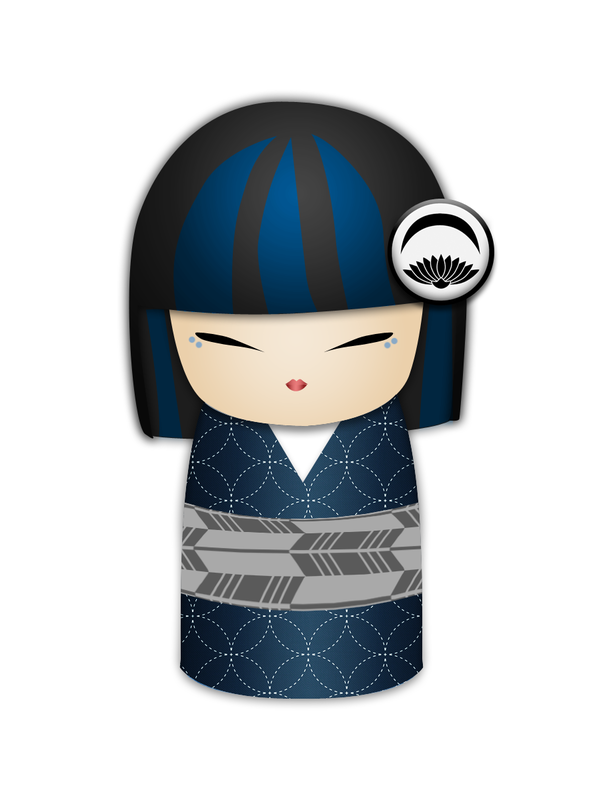 So today is Seijin no Hi (成人の日), or Coming of Age Day in Japan. Traditionally, it’s a day for young adults who have acheived the age of maturity, twenty, to celebrate. It’s traditional for young women to wear their brightest, most fun furisode (long-sleeved kimono), sort of as a way of saying goodbye to childish things. 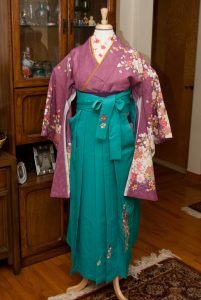 Once women get older and marry, they no longer wear this type of kimono, so for a lot of girls it’s the last “appropriate” time they’ll have to wear one. This year, I will be turning thirty – not twenty. However, I also currently live with my folks (who are incredibly awesome people, and I will get to that again shortly), I work in a toy store, and aside from kimono I collect toys and comic books. It would not be a stretch to say that mentally, I have not really reached any reasonable level of maturity XD. So I figured I may as well bust out one of my furisode, since I rarely have the opportunity to wear them anyway. 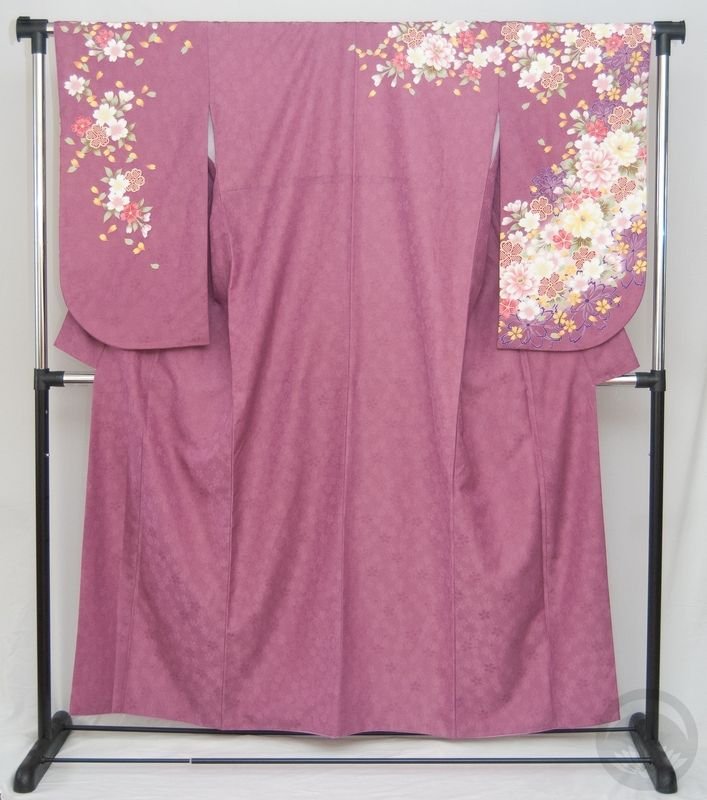 I chose to wear my mauve peony and bamboo furisode, since it’s beautiful and has special meaning to me – I bought it the first time I went to visit my best friend. I paired it up with my irridescent blue-green paving stone obi, and hot pink accessories. Oh, and an eyepatch. As I mentioned in my previous entry, I managed to use my mad coordination skills a week ago to scratch my cornea with a fork. Yes, you did read that right. And yes, it was as painful as you’d imagine. Thankfully it is getting better! Now, to one of the many reasons I have awesome parents. I really wanted to try doing a furisode-appropriate musubi with this outfit, but I don’t own any tools to tie them on myself. My amazing dad offered to help me out, and using his magical engineer brain figured out how to tie a fukura suzume (chubby sparrow) knot in a few mere minutes. Unfortunately, this obi has no core and is incredibly floppy. The bow looked great as long as I stood perfectly still. As soon as I moved, it would just sort of collapse in on itself and look like it had melted. He tried several times, but through no fault of his it just wasn’t going to work. This obi is just too soft. In the end I decided to work with the floppiness and make a sort of a poofy bunko/chou-chou bow-style knot. I think all things considered, it turned out quite well. I also decided to go a bit nuts with my footwear and layered some pinky-ivory lace tabi over some dark purple tabi. I really like how this looks. When I first started this blog, I posted about my amazing crow obi, and mentioned that the silk backing had rotted out due to age, and I had plans to replace it. Fast forward um, a year and a bit, and my procrastinating self has finally accomplished something! The obi fabric and original lining had been sitting folded in a bag for quite a while and I decided it was high time to finally give it the respect it deserves. If you’ve ever been curious about the construction of an obi, or have an obi yourself that needs to be redone, please read on! The first step was to separate the obi silk from the obi-shin (stiffening core). They were not sewn together, but have been stuck to each other for what may be nearly a century at this point, so this involved a bit of careful peeling apart. Once the two pieces were separated, I carefully ironed the seam allowance of the obi silk open. I ironed it enough to make the piece lie flat, but left the original fold line visible so I would have a straight line to sew along later without having to mark up the fabric. Here is the whole piece with the seam allowance ironed flat. You can see how much the colour has faded over the years, but since the allowance will be hidden this isn’t really a problem. I just thought it was interesting and worth sharing. The next step was to pin the wrong sides together of the obi silk and the black satin I was using for a backing piece. This was exceptionally tedious and I pricked my fingers several times! Here’s the entire thing pinned together and taking up too much space on my floor. Yes, there is a disgusting area rug on top of disgusting wall-to-wall carpet on my basement. The floor gets cold so I’d rather icky and comfortable over stylish but clammy! Once everything was pinned together, the next logical step was sewing. Lots and lots and lots of sewing. Due to the fragile nature of the silk and the fact that the obi gets tugged and pulled a lot, this all had to be done by hand, in a closely-spaced but loose slip stitch. I saved a huge amount of time by doing Japanese-style hand-stitching. This is hard to explain, but it basically involves holding the needle still and rocking the thread back and forth until a handful of stitches are lined up on the needle, and then pulling it through. This video gives an amazing visual demonstration with no explanation needed. Once you get the hang of sewing like this, it is an enormous time-saver. Once both long sides are completely sewn, I ironed the seam allowances down again so it would lie flat. I found it easiest to do one fabric and then the other, rather than trying to press both sides at the same time. Once the outer parts of the obi were sewn together, I folded them carefully, put them aside, and got to work on the shin (core). 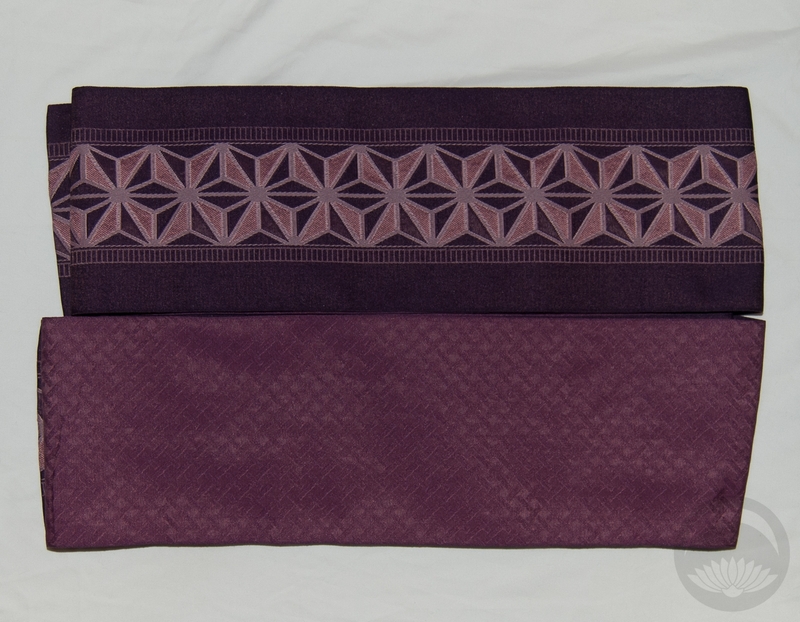 An obi is constructed somewhat like a sandwich, with the two visible pieces of silk on the outside, like the “bread”, and the shin in the centre, like a filling. The shin is usually a piece of heavy cloth, sometimes flannel, sometimes duck-cloth, and it serves to give body and stiffness to the obi. Without the shin, the obi would not lie flat and smooth when wrapped and tied around the body. If you’ve ever seen a cosplayer with a really crumpled, lumpy obi that has sort of collapsed on itself over the course of the day, odds are they made themselves an obi without using any sort of a shin or core. The obi had a shin inside of it, a sort of brushed flannel-y material, but it had gotten incredibly soft over the years, so I decided to reinforce it. I found a roll of obi-shin fabric on eBay, but if you can’t find one specifically, any thicker fabric with a bit of body will work. Because the fabric of the obi itself is so thin, I figured a bit of extra stiffness would be good and used both the old shin and the new one together. I used the old shin to determine the size of the new one. After I’d folded it to match the size of the old piece, I pinned it down and ironed it flat so it would stay in shape. I pinned both shin together temporarily, just to make them easier to deal with and prevent things from shifting around while I worked. With the two pieces pinned together, it was much easier to lay them out and tuck them into the folded seam allowances of the obi lining. Thankfully, I had assistance in the form of a Tribble. And yes, that is her tongue sticking out in the large version. For a mutt-cat, she is incredibly brachycephalic and tends to leave her tongue hanging out a bit because it doesn’t fit in her mouth properly. Poor boo. Once all the pieces were sandwiched together inside-out, the next step was to turn the whole thing right-side-out. First step was to remove all the pins to make sure none got trapped inside when I was done. Unfortunately I do not have any photos of this phase, because both my arms were very busy and my father was helping me. I will do my best to explain how we did it. I held the end open while he reached inside and carefully pinched all four layers and pulled them outwards through the other end. If you’ve ever cased a sausage, it was a similar procedure. After it was properly turned, I used some delicate fabrics hemming tape to shut the ends. I could have sewn it, but I’ve used the hemming tape before and was pleased with how gentle and permanent the results were so I figured I’d save a little time. And here she is, finally finished! I’m very proud that I actually finished this, and am very pleased with the results.